“What we have here is an attractive, compact crossover. It looks like a puffed-up Fit, or Honda Fat if you will. At 169.1 inches in length, the HR-V is more than a foot longer than the Fit (and almost nine inches shorter than the original CR-V). But with clean, taut lines that sculpt the body sides the HR-V is anything but bloated. We particularly like the integration of the rear door handles into the C-pillar. This thing is cute, especially with the rounded nose and chiseled rear end. And the chunky, five-spoke, 17-inch alloy wheels we like so much are standard even on the base model. “On the road, the engine has to work pretty hard getting the HR-V up to speed and it makes a noticeable racket when doing so. “The ride is reasonable for a small SUV -- and better than we thought it would be from a subcompact vehicle. But the underlying basic small-car architecture rears its head when the HR-V is pushed toward its limits or rolling over ugly pavement. “While the HR-V looks quite small from the outside, the cabin actually has a fair amount of passenger space. Adults will find the back seat tolerable -- for a short time. 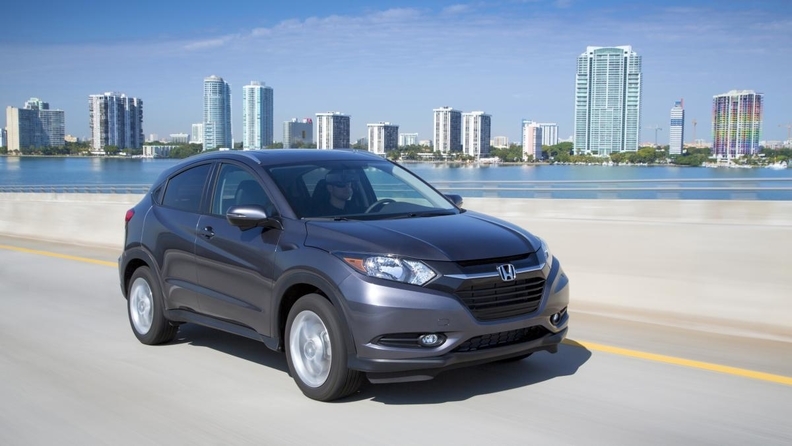 The HR-V can be equipped with heated leather seats, a sunroof, and keyless entry. “Unfortunately, high-end models come with Honda’s lousy touchscreen-only radio. We hated this in the last CR-V we tested, calling it one of the most frustrating designs we’ve seen in a while.